Eating can be quiet a challenge during the first few painful weeks in braces -- especially if you are trying to eat holiday food for Thanksgiving, Christmas, or Chanukah! Brackets are poking into your gums and cheeks, and you just can't seem to chew properly. When you get braces on your teeth, you may find that your teeth don't touch the way they did before, which changes the way you chew. As your treatment continues and your teeth shift, you may continually need to adapt to biting and chewing in a slightly different way. How long will eating be a challenge? Most people find that they are more comfortable and can chew food more properly in 2 to 3 weeks after the braces go on. Patience is the key. Slow down. Chew slowly and carefully, and cut your food into small pieces. Forget about taking big bites of anything, or wolfing down your food. The key word here is: SLOW! Stick to soft food. Eventually you'll be able to eat steak again. But for the next few weeks, lean toward soft foods. 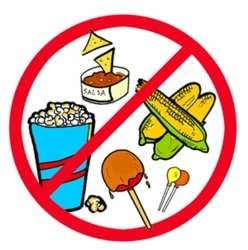 Avoid stringy foods, especially if you have a palate expander. You may love to wind your spaghetti around your fork, but for now it would be better for you to cut it into small pieces, or it will get wound around your brackets. Also, be careful with foods that get stringy when they melt, like mozzarella cheese. Forget the nuts and seeds. These will get stuck in your brackets and drive you crazy until you finally brush and get them out. Ditto for the hulls of popcorn. Sticky foods will likely stick to your brackets and be hard to clean off. You also want to avoid biting into anything hard that may break or pop off a bracket. Bite with the side of your mouth. It may be virtually impossible to bite into anything with your front teeth for a while. Get used to biting with your side teeth, instead. Besides, if you try to bite into a burrito with your front teeth, your front brackets will probably get plastered with tortilla. Speaking of burritos, beware of anything with large hidden chunks of meat or vegetables, like burritos or sandwich wraps. Bite carefully into those types of foods so that you don't choke, or better yet, eat them with a fork and knife instead. Sushi will be very challenging and could gag you. You should probably cut it in half instead of trying to pop an entire piece of it into your mouth. Treat yourself to something cold, such as ice cream, popsicles, or frozen yogurt. The cold temporarily dulls the pain from your braces. (For longer lasting pain relief, check out the gumEase product). Develop an arsenal of soft food recipes. You don't need to sentence yourself to boring soups and shakes. There are several cookbooks that can help you prepare healthy, delicious meals, such as The Braces Cookbook, The Braces Cookbook2, Tender Teeth Cookbook, and Surviving Braces. Also check out the soft food suggestions on our sister website, ArchWired.com. If eating becomes too uncomfortable because of mouth sores or poking brackets, apply plenty of dental wax or dental silicone. Or tray a new product called Comfort Brace. The first few weeks of braces are the worst. But after your gums toughen up with scar tissue, and you get used to chewing and eating differently, you'll find that food isn't giving you as much trouble as it was before. In a few months, you'll be able to manage some crunchy food, and wearing braces won't be as much of a painful ordeal.